It’s no secret that Austin is seriously passionate about progressive barbecue. So much so that we serve barbecue in our airport, out of mobile food trucks, alongside our favorite craft beers, inside live music venues, on our brunch menus, and even on top of donuts! But every advance in barbecue technique is steeped in tradition and the newly opened Cooper’s Old Time Pit Bar-B-Que is a master of traditional Central Texas barbecue. Here in Austin, we have been waiting for Cooper’s barbecue for a long time; nearly two years, in fact. But the renowned Llano barbecue establishment has finally made its way into downtown Austin, and we were lucky enough to score an invite to the soft opening party! 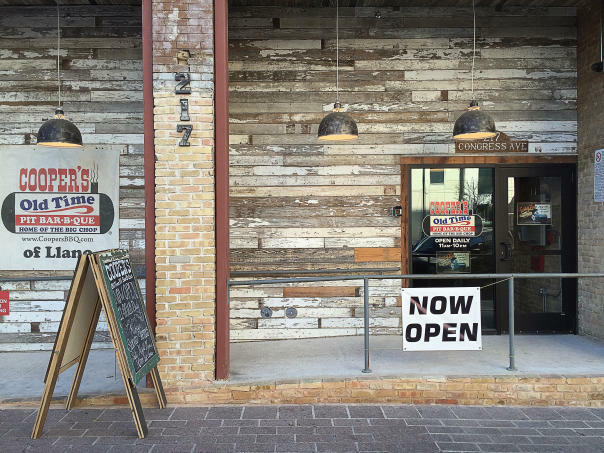 The new Congress Avenue location is housed in a beautiful historic building and the newly restored façade plays homage to an Austin of decades past. It is the ideal spot for anyone staying at the new JW Marriott next door or simply taking a stroll through downtown. This rustic restaurant has a distinctly casual feel, featuring butcher paper instead of dishware, reclaimed wooden accents and plenty of local beers on tap. These pit masters offer every classic kind of meat, slow smoked and barbecued to perfection, alongside an array of sides. Try the spicy jalapeño man-n-cheese and don’t forget to grab a few slices of white bread to soak up the rest of that sweet ‘n spicy barbecue sauce. The opening party featured live music by a couple of local bands which served as a preview of the regular live music that will fill the upstairs Llano Lounge. Cooper’s Old Time Pit Bar-B-Que is now open from 11 a.m. to 10 p.m. daily; the Llano Lounge is open until midnight Sunday-Thursday and until 2 a.m. Friday-Saturday.